Detects a band at 55kDa in mouse A20 cells that we believe corresponds to Plk1 (predicted molecular weight 68kDa). Also gives positive staining in immunohistochemistry in human colon carcinoma as expected. However, we have been unable to conclusively demonstrate the specificity of the antibody for phospho T210 Plk1. Synthetic peptide: C-GERKKTPLCGT, corresponding to amino acids 205-214 of Human Plk1. Purified by immunoaffinity chromatography using phospho peptide coupled to agarose beads followed by solid phase adsorption(s) against non-phospho peptide and non-specific peptide to remove any unwanted reactivities. Our Abpromise guarantee covers the use of ab12157 in the following tested applications. WB 1/200 - 1/2000. Predicted molecular weight: 68 kDa. Additional bands at: 23 kDa, 40 kDa, 42 kDa. We are unsure as to the identity of these extra bands. We believe the 55kDa band represents Plk1. However, we cannot be sure that the antibody is detecting phospho T210 Plk1 specifically. ab12157 was used at a 1:200 dilution to detect Plk1 by immunohistochemistry in human colon carcinoma tumor tissue. Tissue was formalin-fixed and paraffin embedded. Detection with AEC (pink), nuclear counterstaining with Haematoxylin (blue). ab12157 (1/200) detecting Plk1 (phospho T210) in formalin-fixed paraffin embedded human breast carcinoma tissue. Publishing research using ab12157? Please let us know so that we can cite the reference in this datasheet. Dear Technical support I would like to use the anti-PLK1 (phosphor T210) Antibody (ab39068) in an immunofluoescence experiment with mouse cells. However, Abcam webpage says that this antibody is reactive to Human and chiken. 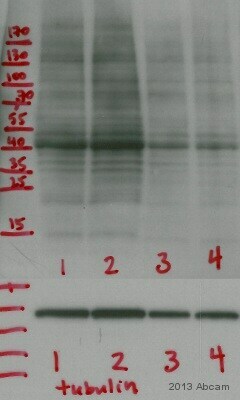 Could you tell me if this antibody really does not work in mouse or if it just was tested in Human and chiken? The immunogen used for this product has 100% homology with the mouse protein (http://www.uniprot.org/uniprot/Q07832). This product has not yet been tested in this species however. Because this has been raised in mouse, using on mouse tissues may lead to high background. As such we cannot guarantee that it would meet the needs of our customers and do not cover this product under our Abpromise guarantee. We do offer a number of other antibodies against PLK1 (phospho T 210) which have not been raised in mouse. I would suggest ab12157 as an alternative.